Gordons Dining Hall is good and all but sometimes there is a need for change or a slightly more romantic date spot than the booths next to the Flamingo Market. Although this spot is slightly more expensive than a meal swipe on the WisCard it truly will not disappoint you or your lucky date. Red Sushi is conveniently located just off of the square and a short walk down State Street on the corner of W. Washington Street and N. Henry Street. As soon as you walk in you will find a sleek Japanese themed spot for a unique but delightful spread of sushi and much more. At Red Sushi the sushi is a huge hit and brings the biggest of crowds but if you’re the kind of person to worry about eating raw fish don’t be nervous the menu doesn’t stop there. Red Sushi offers anything from Seaweed Salad, to Pork Short Rib or the delightful Spicy Tuna Crispy Rice. 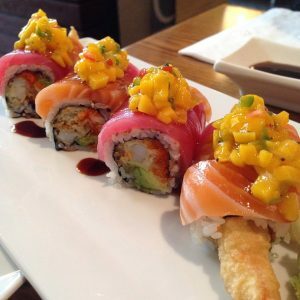 Coming from a frequent Red Sushi visitor and one to not hold back on the raw seafood, I strongly recommend going out on a limb and experimenting with a Firecracker or a Shrimp Tempura roll. With the plethora of options some more expensive than others there is something for everyone to find. So with a big date night planned and a romantic dinner spot needed you may not want to count out Gordon Dining Hall but with Red Sushi just up the street, take the splurge and impress your date.